Brown Sugar Ham Rolls - Sister Schubert rolls split and brushed with a brown sugar glaze and topped with swiss and deli ham - great for parties! Can make ahead of time and freeze for later. These things fly off the plate!! 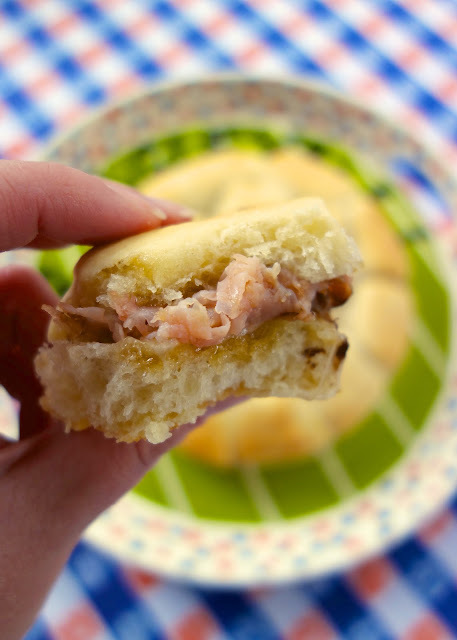 These Brown Sugar Ham Rolls are off the charts! SO delicious!! The brown sugar glaze on the rolls is amazing! The key to these rolls is to get the deli counter to slice your ham super thin - you actually want it shaved, falling apart thin. This is a must. I used Sister Schubert rolls. The secret to easily reassemble the rolls, remove one of the outer rolls and set aside before slicing the rolls in half. This will help line up the top and bottoms easily. Genius! If you don't have access to Sister Schubert rolls (bless you), I am sure you can substitute any precooked dinner rolls. These rolls can be made ahead of time and frozen for later. 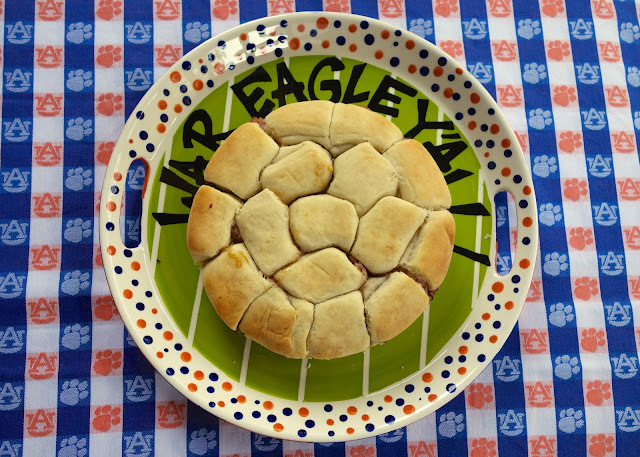 These are great for tailgating and even a quick lunch or dinner. In a saucepan, melt butter, brown sugar and dijon mustard. Stirring continuously. Remove from heat. Brush the sugar mixture on the cut sides of the rolls (don't forget the roll you removed). Place swiss cheese on top of sugar mixture. Top with ham. Place the top half of the rolls on top of the ham, lining up the empty space. Replace the roll in the empty space. I like that these can be made ahead of time! They are the perfect size too! Love these Stephanie! We make something similar using Hawaiin rolls, a great option if you don't have access to Sister Schuberts. And we heat them in the crockpot on super low, rubbing butter on top of each so they don't stick. do your rolls need to thaw first?? If you wanted to prepare ahead and freeze, would you freeze before cooking, or after? You would freeze them before baking. Oh yum! I need to try these! :) WDE! I do a savory version of this with butter, mustard, poppy seed and onion. Always a tailgate hit! These are AWESOME! My go to baby shower, wedding shower, brunch food. I used to make them with the Pepperidge Farm rolls because there were 12 perfect square rolls in the foil pan. Then, Pepperidge farm stopped putting them in foil pans and moved to waxed paper. Boo! These do not freeze well and then bake if they are not in a foil pan. They stay gooey instead of crisping up on the bottom. I've never thought of using Sister Schuberts so thanks for the tip! I bet the brown sugar makes these amazing! Perfect sandwiches for a get together, can't wait to share these with friends! Brown sugar glaze on my sandwich! Count me in! Made these with 6 inch poboy rolls for lunch--really excellent! I did leave them wrapped in the foil for the entire baking time, since poboy rolls have hard crusts already. Yep, we love Sister Schubert in our house too! Thanks so much for the link, Im going to try adding cheese to a batch this weekend for the UNC UVA tailgate! Hope you like the addition! I am obsessed with these rolls! I have to make these ... and soon. Thanks Stephanie. Pinned. Make them very soon! They are SO good! Have you ever made them using your "7-up biscuits" recipe? Baking the biscuits first of course. I haven't, but that sounds like a good idea! Wonderful! My husband (who doesn't like ham all that much) and I (who can't stand mustard) both LOVED these!!! Made as written, and will make again just the same! I'm making these for dinner tonight! Love your tablecloth and plate. War Eagle! !